We Moved Back to Nashville! Things have finally calmed down a bit after our crazy move back to Nashville. We made the decision to sell the Airstream and move back home fairly quickly and it was a whirlwind. We're all settled in now and I'm back with the weekly newsletter! There have been so many awesome things I've been wanting to share with you, so I'm thrilled to be back. I've also jumped straight into helping clients here in Nashville and it's been great! I am loving working with people in person again (Don't worry—I'm still doing remote appointments). If you didn’t see my last email about opening up my calendar for local appointments, here’s notice! You can schedule some time here. Looks like we might see a blue and orange version of the iPhone X the second half of this year. The mockups of the possible color look great. The orange one looks more bronze to me. Would you stick with the traditional colors or pick something different for your next phone? We've got some great practical updates for Mac OS and iOS coming up soon. They’re making our stuff more secure and the next version of iOS should actually speed up your phone instead of slowing it down like we usually see. Hooray for that! We’ll also see more organization options in Mac OS like grouping like items together on the desktop for you automatically. In addition, more information about the items on your computer will be handy to tell files apart for those of you who don’t diligently name your files. All in all we’re going to see refinement in the next versions of Mac OS and iOS. In the end, I’ll take that over new features that are half baked. I’ve been in monitor land this past week setting up a new office for a client. I got a couple different monitors for the office and I’m really impressed. The LG 27” Thunderbolt 3 display is gorgeous. The first go around got TERRIBLE reviews. Since then, they’ve fixed the issues and my contact at the Apple Store says they never get returned anymore. I picked a few up and love them. They have a camera and speakers built in. If you have the newer MacBook models with USB C, you only have one cable to plug in for power, sound, video and everything. If you have an older generation machine, just use the Thunderbolt 3 to Thunderbolt 2 adapter and a Thunderbolt 2 cable. 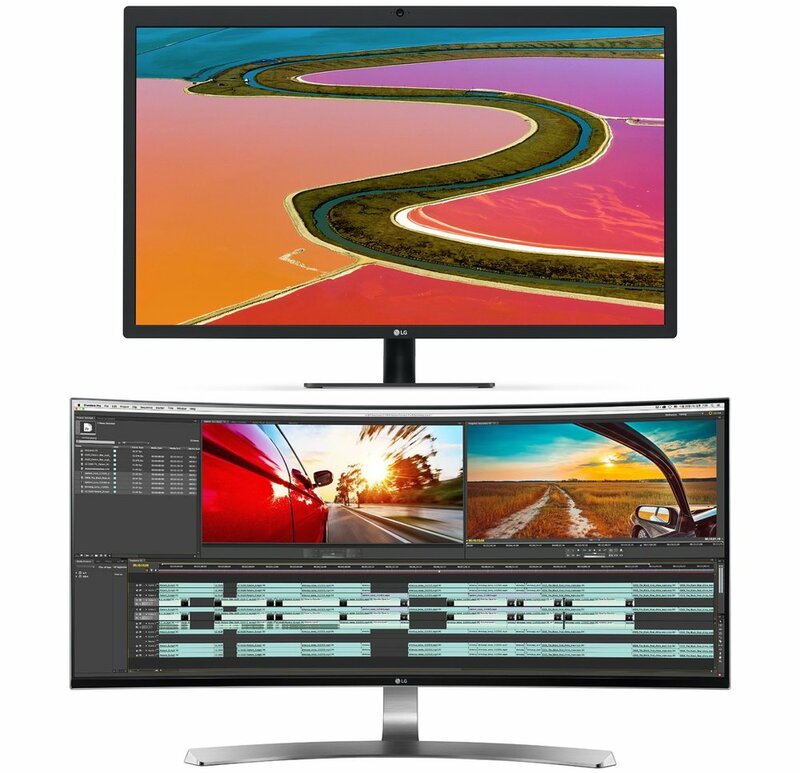 The other monitor we picked up is the LG 34UC98-W 34” Ultrawide monitor. This thing is slick! It’s got a bunch of ports on the back so it acts as a hub, has speakers built in, and you can run 3 web browsers side by side on the one display. I’d love a webcam built in, but a Logitech C920 will do the trick and looks great on top of the display. It’s even got a mic built in so you’re good to go for virtual meetings. If you have a new laptop with USB C, pick up the same adapter I pointed out above and you're good to go! Beware, these are not the cheapest monitors you can get, they’re some of the more expensive ones out there, but why they demand more money is all the stuff built into them: speakers, webcams, hubs for multiple connectors, and Thunderbolt—the most expensive connectors out there. If you’re going for an ultra clean setup, either of these will serve you beautifully. The biggest complaint I hear about the Messages app is that it doesn’t sync properly between devices. It hasn’t been nearly as reliable as email. And if you have to erase your phone or computer and start over fresh, you can’t restore those messages—Until now! You need to have the latest operating system on all your devices. Once done, you can sync your Messages to iCloud. On iOS, go to Settings > Tap on your name at the top > iCloud > Toggle on Messages. On your Mac go to the Messages app > Preferences > Account > Enable Messages on iCloud. You should be all set up! This one you’re going to want to show off to your friends and family :) Open up th Apple Maps app on your iPhone or iPad. Type in Nashville and tap on the suggested city. Tap flyover. Now stand up and turn around pointing your phone all over the room. Pretty sweet, huh? This is an example of augmented reality, similar to virtual reality. It uses your camera to judge where you are and place objects in the room if that’s a feature of the app. In Flyover you can pinch to zoom in or out so you can tour the city quickly or slowly. Have fun playing Godzilla! Did you know your Mac comes with Garageband? And with it comes lessons for a bunch of instruments? They used to have an option to pay extra for artist lessons, but they just did away with payment and are offering it for free. In addition to that, they’ve added over a thousand loops and other sounds for your music making endeavors! Garageband is a highly overlooked app that can be a ton of fun, even if you’re not musically talented, like me. You can use built in loops and electronic instruments to create anything from a short jingle to a full album. It’s incredible! If you or someone in your family is interested in music, download the latest update for Garageband from the App Store and let them loose! If you want to dive deeper into how Garageband works, head over to Help menu after you open the app. There are text and video instructions that are actually useable and will walk you through the basics. Want to dive deeper? Snag a lesson at lynda.com or reach out to me! Older PostMoving Back to Nashville!